Before we see what the Blog workspace item form looks like we need to configure the Main Menu and add a menu item for the Blog workspace. Let’s create a category for the blog and put the blog workspace into it. If there are more than one workspaces in a category, the menu item expands into a sub-menu containing menu items for each workspace in the category, as can been seen from the Main Menu Designer in the image above and the Main Menu in the image below. The one thing I didn’t explain is the creation of users, groups and roles, which is pretty straight forward. 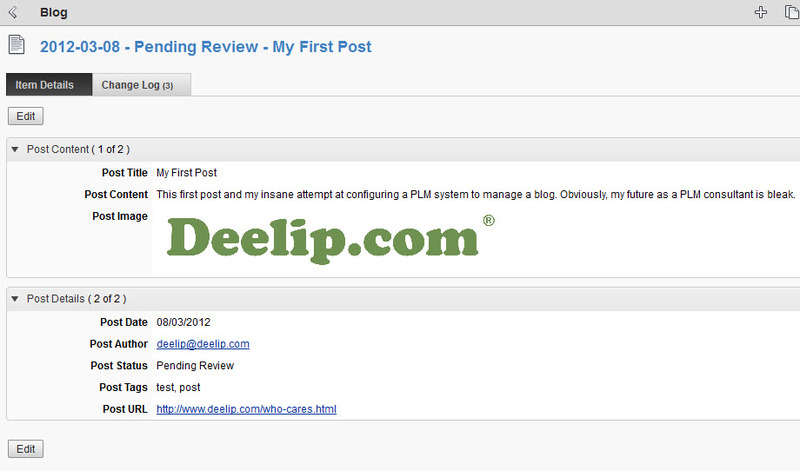 I created a user called “deelip” and placed him in a new group called “Blog” to which I assigned a new role called “Blogger”. I gave the “Blogger” role access to the Blog workspace and it shows up in the Main Menu (see first menu item in image above). I click the Blog menu item in the Main Menu and am taken the to Blog workspace. To add a new item I click the new button and am presented with form split up according to the sections I created earlier. This is what the Blog workspace item looks like. This is just about the most basic thing that can be done in Autodesk PLM 360. Creating a workspace, defining the fields a workspace item, creating a layout for the item and adding the workspace to the Main Menu. I have merely scratched the surface of Autodesk PLM 360. If I get the time I may actually set up a blog with comments, moderation and stuff. Set up workflows, create relationships between workspace items, etc.. So is Autodesk PLM 360 insanely configurable? Its hard to say from the little that I did. But it seems pretty easy to configure. I mean, for someone who has no prior experience in a PLM system I was able to add an entirely new workspace to the PLM 360. And all this in about an hour of fooling around with the system and occasionally referring to the online help. If people actually put their minds to it, I think they could figure out and do a whole lot more. How does Autodesk PLM 360 compare to other PLM systems out there? I don’t know because I haven’t configured any of them. But I will say this. To try out Autodesk PLM 360 all I did was fill out a simple form and I got an email with a URL, username and password. I didn’t have to download anything. I didn’t have to install anything. The system was ready to use out of the box. Or rather, as the folks at Autodesk put it, “There is no box”. I strongly recommend that you try it out yourself. Visit www.autodeskplm360.com.